Maximilien François Marie Isidore de Robespierre (May 6, 1758 – July 28, 1794) was one of the primary leaders of the French Revolution. His supporters knew him as "the Incorruptible" because of his austere moral devotion to revolutionary political change. He was an influential member of the Committee of Public Safety and was instrumental in the period of the revolution commonly known as the Reign of Terror that ended with his arrest and execution in 1794. Politically, Robespierre was a disciple of Jean-Jacques Rousseau, among other Enlightenment philosophes, and a capable articulator of the beliefs of the left-wing bourgeoisie. He was described as physically unimposing and immaculate in dress and personal manners. His name is associated with the Reign of Terror which claimed thousands of lives of "enemies of the Revolution." Robespierre was born in Arras, France on May 6, 1758. His family, according to tradition, was of Irish descent, having emigrated from Ireland at the time of the Reformation in the "Flight of the Earls" to escape English oppression. His direct ancestors in the male line had been notaries in the little village of Carvin near Arras from the beginning of the seventeenth century. However, several genealogists have traced his family back to the Middle Ages in Northern France. His paternal grandfather established himself in Arras as a lawyer. His father, also a lawyer, married Jacqueline Marguerite Carraut, the daughter of a brewer, in 1757. Robespierre was the eldest of four children. In 1767 Madame Derobespierre, as the name was then spelled, died. Her husband left Arras and wandered about Europe until his death in Munich in 1777, leaving the children to be raised by their maternal grandfather and aunts. Robespierre attended the college of Arras. In 1770, on the recommendation of the bishop, he obtained a scholarship at the Lycée Louis-le-Grand in Paris. Here he learned to admire the idealized Roman Republic and the rhetoric of Cicero, Cato, and other classic figures. His fellow pupils included Camille Desmoulins and Stanislas Fréron. While attending the college, King Louis XVI arrived for an honorable visit. Robespierre would deliver a speech welcoming the king, to which the king supposedly paid little attention. Ironically, Robespierre would eventually play a key role in his execution. Robespierre completed his law studies with distinction and was admitted to the bar in 1781, returning to Arras to practice law. His reputation preceded him, and the Bishop of Arras, M. de Conzié, appointed him criminal judge for the diocese of Arras in March 1782. Though his sister claimed that he immediately resigned to avoid sentencing anyone to death, this claim is false. A criminal death warrant for a murderer exists with his signature on it and he did not leave this position until at least 1788. He soon had a successful legal practice. He turned to writing and cultivated local society, where he was regarded one of the best writers—as well as one of the most popular "dandies"—of Arras. In December 1783, Robespierre was elected to the academy of Arras and regularly attended its meetings. In 1784 he earned a medal from the academy of Metz for his essay on whether the relatives of a condemned criminal should share his disgrace, perhaps an early indication of the moral absolutism that would characterize his leadership during the Reign of Terror. He split the prize with Pierre Louis de Lacretelle, a lawyer and journalist in Paris. 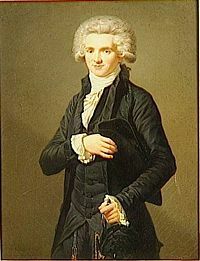 Many of his subsequent essays were less successful, but Robespierre became popular in the Rosati, the literary and musical society at Arras, where Lazare Nicolas Marguerite Carnot was also a member. In 1788 Robespierre took part in the discussion about the way the Estates-General should be elected. He stated in his Adresse à la nation artésienne that if the former mode of election by the members of the provincial estates were adopted, the new Estates-General would not represent the people of France. Robespierre, the chief opponent of the leading members of the corporation, was elected alongside them. Rivalry was strong in the assembly of the bailliage, but Robespierre had begun to make his mark in politics with the Avis aux habitants de la campagne (Arras, 1789). He secured the support of the country electors, and although he was only 30, comparatively poor and lacked patronage, he was elected fifth deputy of the third estate from Artois to the Estates-General. When the Estates-General met at Versailles on May 5, 1789, Robespierre was one of the leading radicals. As Honoré Mirabeau reportedly stated: "That young man believes what he says; he will go far." Robespierre was a fervent supporter of the doctrines of Rousseau and had begun to shape them into his own vision. While the National Constituent Assembly of provincial lawyers and wealthy bourgeois started to draw up a constitution, Robespierre turned to the people of Paris. He was a frequent speaker in the Constituent Assembly (over 150 speeches before 1791) often with great success although his voice is noted as being "high-pitched [and] metallic." He was eventually recognized as second only to Pétion de Villeneuve as a leader of the extreme left, a group Mirabeau called the "thirty voices." When Robespierre realized that his ideas would not be popular in the assembly, he turned to the Society of the Friends of the Constitution, better known as the Jacobin Club. It originally consisted only of the Breton deputies, but after the Assembly moved to Paris the club began to accept members from various leaders of the Parisian bourgeoisie. Eventually many artisans and small shopkeepers joined them. Robespierre had found his audience and followers. As the wealthier bourgeois of Paris and moderate deputies seceded to the Club of 1789, the influence of the old leaders of the Jacobins (Antoine Pierre Joseph Marie Barnave, Adrien Duport, Alexandre-Théodore-Victor, comte de Lameth) diminished. When they founded the Feuillants in 1791, alarmed at the progress of the Revolution, Robespierre's followers had dominated the Jacobins. Mirabeau's death strengthened Robespierre's influence in the assembly. On May 15 (or 16), 1791, he proposed and carried the motion that no deputies who sat in the Constituent Assembly could sit in the succeeding assembly, which became known as the "self-denying ordinance." The 1911 Encyclopedia Britannica article on Robespierre attributed this much-censured stance to his "lack of statesmanlike insight and his jealous suspicion of his colleagues." After the Flight to Varennes of Louis XVI and his family failed on June 20 with their arrest at Varennes, Robespierre declared that he was ni monarchiste ni républicain ("neither monarchist nor republican"). After the massacre of the Champ de Mars on July 17, 1791, Robespierre moved into the house of Maurice Duplay in order to be nearer to the assembly and the Jacobins. Duplay, a cabinetmaker who lived in the Rue Saint-Honoré, was an ardent admirer of Robespierre. Except for two short intervals, Robespierre lived at Duplay's house until his death. According to various sources, including his doctor, Souberbielle, a juror on the Revolutionary Tribunal, Vilate and Duplay's youngest daughter (who would later marry Philippe Le Bas), Robespierre became engaged to Duplay's eldest daughter, Éléonore Duplay. With the dissolution of the Constituent Assembly on September 30, the people of Paris crowned Jérôme Pétion de Villeneuve and Robespierre as the two "incorruptible" patriots. Afterwards Robespierre went for a short visit to Arras, where he met a triumphant reception. In November he returned to Paris. 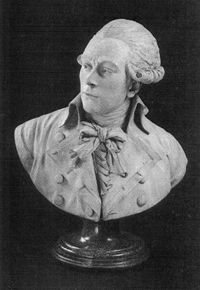 On December 18, 1791, Jacques Pierre Brissot, the dame politique of the Girondist party in the Legislative Assembly, urged that France should declare war against Austria. Marat and Robespierre opposed him, because they feared the possibility of militarism, which might then be turned to the advantage of the reactionary forces. This opposition from expected allies irritated the Girondins and political rivalry arose between them. Robespierre continued to oppose the war even when the Girondins, especially Brissot, attacked him. In April 1792, Robespierre resigned the post of public prosecutor at the tribunal of Paris, which he had held since February, and started a journal, Le Defenseur de la Constitution, in his own defense. During the summer of 1792, neither the Girondins nor Robespierre took any active part in the overthrow of the monarchy. Billaud Varenne and, it is said, Georges Danton led the insurrection of August 10 and took the Tuileries. The Girondins, however, were quick to take advantage of this. Robespierre took his seat on the Commune of Paris, hoping to check the Girondins. Because of his popularity, his reputation for virtue and his influence over the Jacobin Club, the strongmen of the commune were glad to have Robespierre's aid. On August 16, Robespierre presented the petition of the Commune of Paris to the Legislative Assembly, demanding the establishment of a revolutionary tribunal and the summoning of a convention. Robespierre's failure to quell the massacres of September showed that the Commune had more confidence in Billaud than in him. However, he was popular enough to be elected first deputy for Paris to the National Convention. Robespierre and his allies took the benches high at the back of the hall, giving them the label 'the Mountain' (Montagnards); below them were the Manège of the Girondins and then 'the Plain' of the independents. 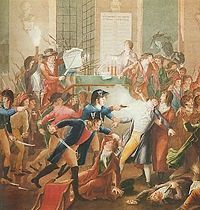 At the convention, the Girondins immediately attacked Robespierre. As early as September 26 the Girondist Marc-David Lasource accused Robespierre of wanting to form a dictatorship. He later heard a rumor that Jean-Paul Marat, Georges Danton and himself were plotting to become triumvirs. On October 29, Jean-Baptiste Louvet de Couvrai attacked Robespierre in a speech, possibly written by Madame Roland. Robespierre easily rebutted the false accusation in this attack on November 5 when he denounced the federalist plans of the Girondins. This is no trial; Louis is not a prisoner at the bar; you are not judges; you are—you cannot but be—statesmen, and the representatives of the nation. You have not to pass sentence for or against a single man, but you have to take a resolution on a question of the public safety, and to decide a question of national foresight. It is with regret that I pronounce, the fatal truth: Louis ought to perish rather than a hundred thousand virtuous citizens; Louis must die, so that the country may live. Robespierre argued that the king, having betrayed the people when he tried to flee the country was a danger to the state as a unifying symbol for the enemies of the Republic, although in Robespierre's eyes he was guilty of being a king. During the debate of January 1793, he and many other members, such as Jean-Paul Marat, Georges Danton, Camille Desmoulins and Antoine de Saint-Just, opposed the Girondins and the few remaining Royalists. The Girondin arguments convinced the convention that there should be a trial. By a vote of 721–0 (with 29 deputies absent), the king was found guilty. The Girondins opposed executing the king and proposed that his verdict and sentence be submitted to a popular referendum. Robespierre and his associates said that asking for a referendum showed sympathy for the king and were attempts to delay his execution. Rhetoric of Robespierre swayed the convention and it voted 424–283 against the referendum. Last minute attempts to delay the king's execution failed, and Louis XVI was guillotined on January 21, 1793. After the king's execution, Robespierre's, Danton's, and the pragmatic politicians' influence increased at the expense of the Girondins. The Girondins refused to have anything more to do with Danton and the government became more divided. In May 1793, Camille Desmoulins, at the behest of Robespierre and Danton, published his Histoire des Brissotins and Brissol demasqué. Maximin Isnard declared that Paris must be destroyed if it came out against the provincial deputies. Robespierre preached a moral "insurrection against the corrupt deputies" at the Jacobin Club. On June 2, a large crowd of armed men from the Commune of Paris came to the Convention and arrested 32 Girondin deputies on charges of counter-revolutionary activities. On March 11, a Revolutionary Tribunal was established in Paris. On April 6, the nine-member Committee of Public Safety replaced the larger Committee of General Defense. On July 27, 1793, the convention elected Robespierre to the committee, although he had not sought the position. The Committee of General Security began to manage of the country's internal police. Historians disagree on Robespierre's role in the Terror. Some say that he was a minor player in the Committee of Public Safety. Babeuf and Philippe Buonarroti have tried to absolve him by saying he acted only for reasons of political expediency. However, Robespierre's role as a leader and mouthpiece of the Terror is relatively clear; Robespierre is generally regarded as the dominant force on the committee. Louis-Sébastien Mercier coined the term "Sanguinocrat" to describe Robespierre. However, after his death many of his colleagues tried to save themselves by blaming him. If virtue be the spring of a popular government in times of peace, the spring of that government during a revolution is virtue combined with terror: virtue, without which terror is destructive; terror, without which virtue is impotent. Terror is only justice prompt, severe and inflexible; it is then an emanation of virtue; it is less a distinct principle than a natural consequence of the general principle of democracy, applied to the most pressing wants of the country. … The government in a revolution is the despotism of liberty against tyranny. In the winter of 1793–1794, a majority of the committee decided that the Hébertist party must perish or its opposition within the committee would overshadow the other factions due to its influence in the Commune of Paris. Robespierre also had personal reasons for disliking the Hébertists for their "atheism" and bloodthirstiness. On Danton's suggestion, Camille Desmoulins protested the Terror in his third issue of Le Vieux Cordelier (Robespierre had read and approved of the first two issues). From February 13 to March 13, 1794, Robespierre withdrew from active business on the committee due to illness. During that time, he decided that the end of the Terror would mean the loss of political power he hoped to use to create the Republic of Virtue. He broke with Danton and joined in attacks of Danton and the Hébertists. Robespierre charged his opponents with complicity with foreign powers. The charges against Danton—reaching from accusations of corruption to alleged spying for Pitt and plotting to restore monarchy—were "even by the standards of the Revolutionary Tribunal, an incredibly feeble document." On March 15, Robespierre reappeared in the convention; on March 19, Hébert and nineteen of his followers were arrested and on March 24 they were guillotined. On March 30, Danton, Camille Desmoulins and their friends were arrested, tried on April 2 and guillotined on April 5. After Danton's execution, Robespierre worked to develop his own policies. He used his influence over the Jacobin Club to dominate the Commune of Paris through his followers. Two of them, Jean-Baptiste Fleuriot-Lescot and Claude-François de Payan, were elected mayor and procurer of the commune respectively. Robespierre tried to influence the army through his follower Saint-Just, whom he sent on a mission to the frontier. In Paris, Robespierre increased the activity of the Terror: no one could accuse him of being a moderate. He hoped that the convention would pass whatever measures he might dictate. To secure his aims, another ally on the committee, Georges Couthon, introduced and carried on June 10 the drastic Law of 22 Prairial. Under this law, the Tribunal became a simple court of condemnation without need of witnesses. The result of this was that until Robespierre's death, 1,285 people were guillotined in Paris. Robespierre's desire for revolutionary change was not limited to the political realm. He sought to instill a spiritual resurgence in the French nation based on Deist beliefs. Accordingly, on May 7, 1794, Robespierre had a decree passed by the convention that established a Supreme Being. The notion of the Supreme Being was based on ideas that Jean-Jacques Rousseau had outlined in The Social Contract. In honor of the Supreme Being, a great celebration was held on June 8. Robespierre, as President of the Convention, walked first in the festival procession and delivered a speech. Is it not He whose immortal hand, engraving on the heart of man the code of justice and equality, has written there the death sentence of tyrants? Is it not He who, from the beginning of time, decreed for all the ages and for all peoples liberty, good faith, and justice? He did not create kings to devour the human race. He did not create priests to harness us, like vile animals, to the chariots of kings and to give to the world examples of baseness, pride, perfidy, avarice, debauchery, and falsehood. He created the universe to proclaim His power. He created men to help each other, to love each other mutually, and to attain to happiness by the way of virtue. A nineteenth-century painting of the night of 9 Thermidor, espousing National Guardsman Merda's claim of having shot Robespierre. There is also the same picture without the gunsmoke, although no one can be sure which is most accurate. At the end of June, Robespierre retired from the convention to plan his next move. He reappeared on July 26 and delivered a two-hour-long speech, warning of conspiracy against the republic. He accused some deputies of injustice and excess and stated that the Committees of Public Safety and General Security should be reformed. At first the convention passed his motions; but Joseph Cambon, the financier, Billaud-Varenne, Jean-Pierre-André Amar and Marc-Guillaume Alexis Vadier and the convention rescinded these decrees and referred Robespierre's motions to committee. On the following day, July 27 (or in the revolutionary calendar 9 Thermidor), when Saint-Just began to speak on behalf of Robespierre, his opponents shouted "Down with the tyrant!" When Robespierre stopped in his speech to answer the attacks on him, there was a shout "C'est le sang de Danton qui t'étouffe" ("The blood of Danton chokes you"). The arrest of Robespierre, his supporters Couthon and Saint-Just and two young deputies, his brother Augustin Robespierre and Philippe François Joseph Lebas, was ordered at 5:00 P.M. Troops from the commune rescued them from prison and brought them to the Hôtel de Ville, Paris. There, his adherents surrounded him, led by Payan and Coffinhal. The convention met again when they heard of Robespierre's release and declared him and the communards outlaws. National Guard troops, under the command of Paul François Jean Nicolas, vicomte de Barras, marched to the Hôtel de Ville to arrest them. Lebas shot himself, Augustin Robespierre jumped from a high window, Couthon was found with broken limbs on a stair, and Robespierre was shot in the jaw before he was taken away. A young gendarme, Merda, claimed that he shot Robespierre when he was writing an appeal to the citizens of Paris to take up arms for him, though Thomas Carlyle and almost all other historians instead suggest that the wound (shattered jaw) was a failed suicide attempt. All the released deputies were rearrested. The next day, Robespierre was taken before the tribunal and guillotined without trial on the Place de la Révolution on the 10th Thermidor An II (July 28, 1794). Couthon, Saint-Just and 19 of Robespierre’s followers were also executed. According to legend, he was the only man to be guillotined face-up. His corpse and head both are buried in the common cemetery of Errancis (now the Place de Goubeaux) in an unmarked grave. Robespierre is still a controversial figure. He has defenders like Albert Soboul, who viewed most of the measures of the Committee for Public Safety necessary for the defense of the Revolution and mainly regretted the destruction of the Hébertists and other enragés. A well-educated and accomplished young lawyer, he might have acquired a good provincial practice and lived a happy provincial life had it not been for the Revolution. Like thousands of other young Frenchmen, he had read the works of Rousseau and taken them as gospel. Just at the very time in life when this illusion had not been destroyed by the realities of life, and without the experience which might have taught the futility of idle dreams and theories, he was elected to the states-general. Billaud-Varenne systematized the Terror because he believed it necessary for the safety of the country; Robespierre intensified it in order to carry out his own ideas and theories. Robespierre's private life was always respectable: he was always emphatically a gentleman and man of culture, and even a little bit of a dandy, scrupulously honest, truthful and charitable. In his habits and manner of life he was simple and laborious; he was not a man gifted with flashes of genius, but one who had to think much before he could come to a decision, and he worked hard all his life. 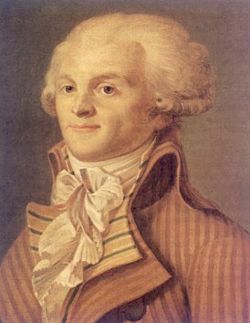 Conservative and royalist historians have traditionally viewed Robespierre as a demagogue and have often criticized him over his role in the suppression of the royalist uprising in the Vendée. ↑ Scurr, Ruth. Fatal Purity: Robespierre and the French Revolution. London: Metropolitan Books, 2006. ISBN 0805079874. This legend was included in the 1911 Encyclopædia Britannica, and has been much-reproduced online. ↑ Mantel, Hilary. “If you’d seen his green eyes.” London Review of Books 28:8 (April 20, 2006). Retrieved October 9, 2006. ↑ "Sieyes, Emmanuel-Joseph," Encyclopedia Britannica, Eleventh Edition, 1911. ↑ World Future Fund. Robespierre Quotes on Terror. Retrieved March 23, 2007. ↑ World Future Fund. Robespierre Speech on Religion of the Supreme Being. Retrieved March 23, 2007. ↑ Carlyle, Thomas. The French Revolution: A History. Classicauthors.net. Cyber Studios, Inc. Retrieved March 23, 2007. Baker, Keith Michael (ed.) (1987). The Old Regime and the French Revolution. Chicago: University of Chicago Press. ISBN 0226069354. Carlyle, Thomas (2002). The French Revolution: A History, Volume III: The Guillotine. Cambridge, M.A. : IndyPublish.com. ISBN 1404303987. A Romantic account more useful for historiographical studies than as accurate history. Doyle, William, Haydon, Colin (eds.) (1999 (hardcover), 2006 (paperback)). Robespierre. Cambridge: Cambridge University Press. ISBN 0521591163 (hardcover); ISBN 0521026059 (paperback). A collection of essays covering not only Robespierre's thoughts and deeds but also the way he has been portrayed by historians and fictional writers alike. Eagan, James Michael (1978). Maximilien Robespierre: Nationalist Dictator. New York: Octagon Books. ISBN 0374924406. Presents Robespierre as the origin of Fascist dictators. Hampson, Norman (1974). The Life and Opinions of Maximilien Robespierre. London: Duckworth. ISBN 0715607413. Presents three contrasting views on him. Jordan, David P. (1989). The Revolutionary Career of Maximilien Robespierre. Chicago: University of Chicago Press. ISBN 0226410374. Sympathetic but not uncritical left-wing study. Lenotre, Georges. (1927). Robespierre's Rise and Fall. London: Hutchinson & Co.
Linton, Marisa. "Robespierre and the Terror." History Today 56: 8 (August 2006): 23–29. Palmer, R.R. (1941). Twelve Who Ruled: The Year of Terror in the French Revolution. Princeton, N.J.: Princeton University Press. ISBN 0691051194. A sympathetic study of the Committee of Public Safety. Rudé, George (1976). Robespierre: Portrait of a Revolutionary Democrat. New York: Viking Press. ISBN 0670601284. Very sympathetic Marxist analysis that compares him with Vladimir Lenin and Mao Zedong. Schama, Simon (1989). Citizens: A Chronicle of the French Revolution. New York: Alfred A. Knopf. ISBN 0394559487. Soboul, Albert. "Robespierre and the Popular Movement of 1793–4." Past and Present 5 (May 1954): 54–70. Thompson, James M. (1988). Robespierre. Oxford: Blackwell Publishers. ISBN 063115504X. All links retrieved September 7, 2018. This page was last modified on 7 September 2018, at 18:40.